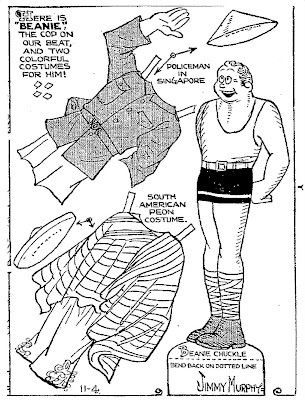 Another Modern Mother Goose Cutout by Addie R. Woodruff that appeared in newspapers in February of 1937. 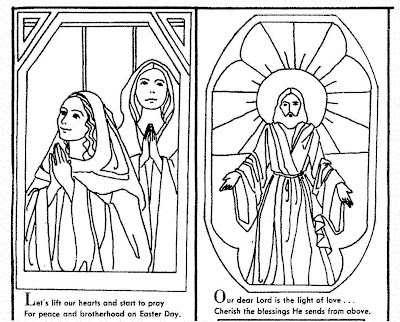 This paper doll is of Mary, Mary, Quite Contrary, how does your garden grow? You haven't time for tending it when motoring you go; You'd better swing that sprinkling can if you want flowers later, Instead of using it to fill your auto's radiator. 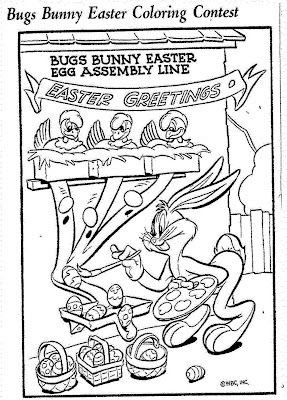 This newspaper coloring contest for EASTER appeared in papers in March of 1964. 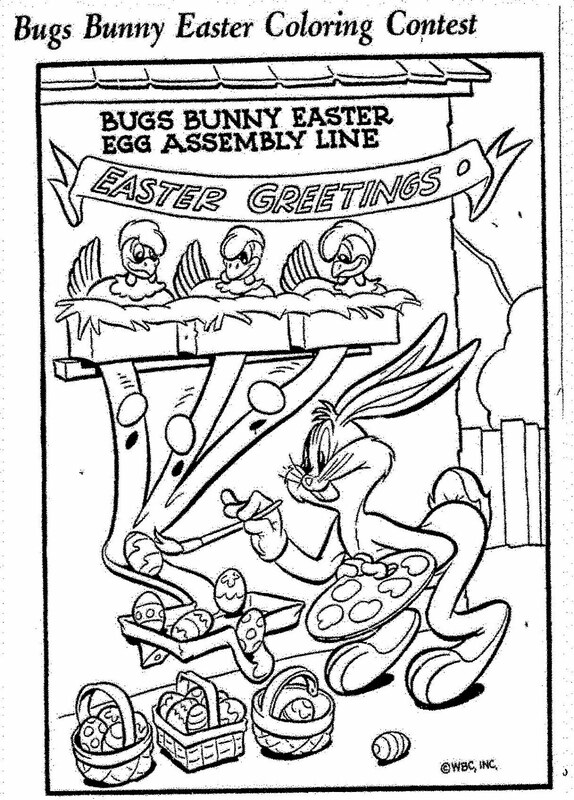 The Bugs Bunny Easter Coloring Contest ran in newspapers for over 10 years. 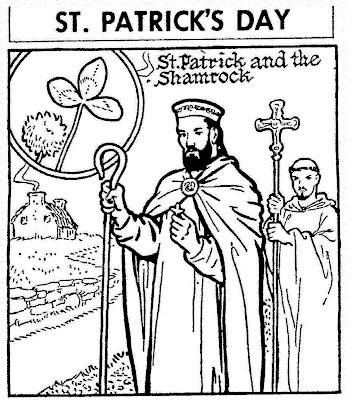 This image is from 1953. 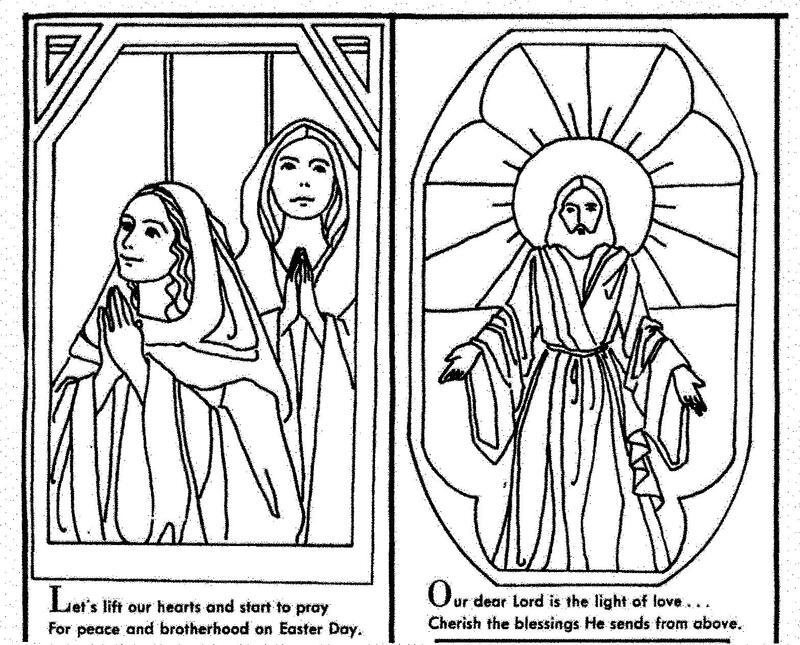 These images are from an Easter coloring contest that ran in an Ohio newspaper in April of 1974. 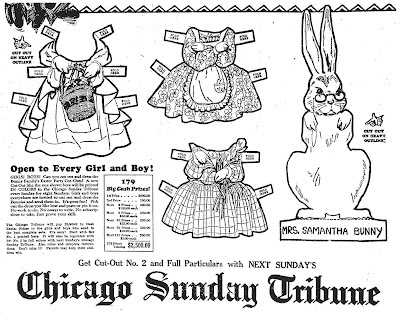 Honey Bunny paper doll is another cut-out contest from the Chicago Tribune. 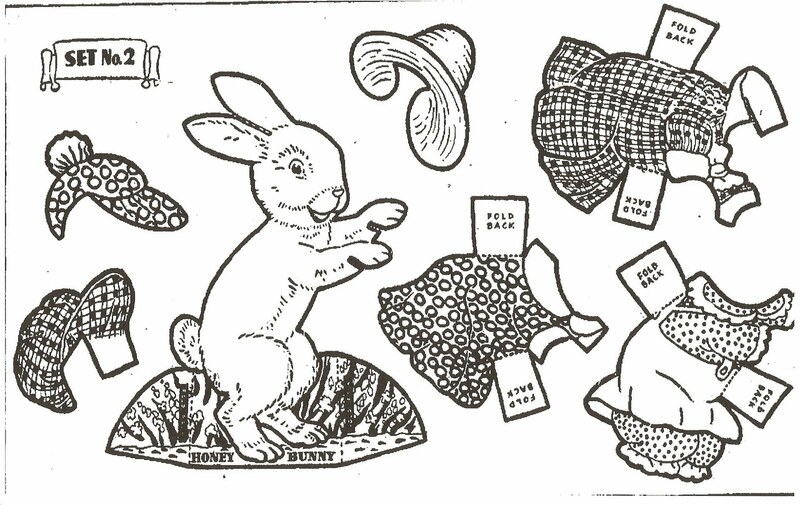 This is from the ad for the Honey Bunny paper doll contest. 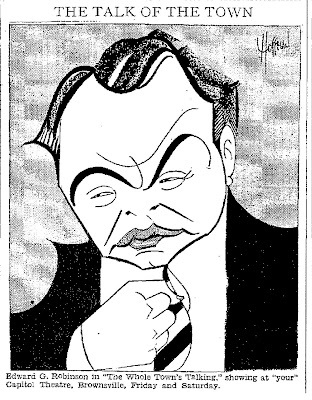 The ad ran in an Indiana newspaper in March of 1938. 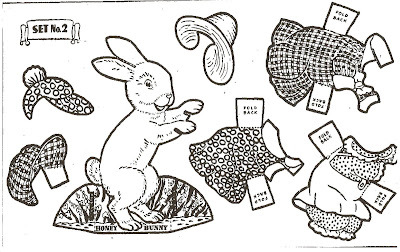 This Rabbit Paper Doll appeared in the Aunt Elsie section of the Oakland Tribune on April 10, 1921. 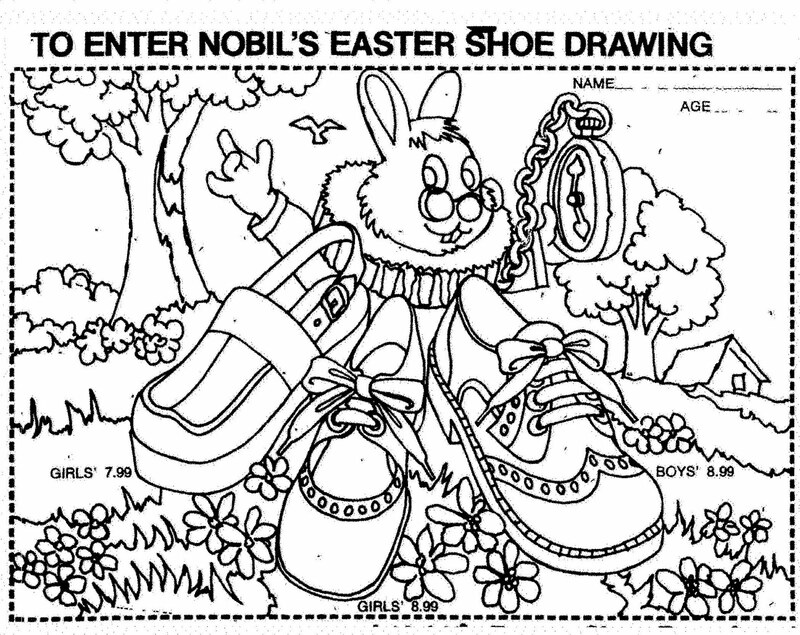 This NOBIL'S Easter Shoe Coloring Contest appeared in various newspapers in 1975. 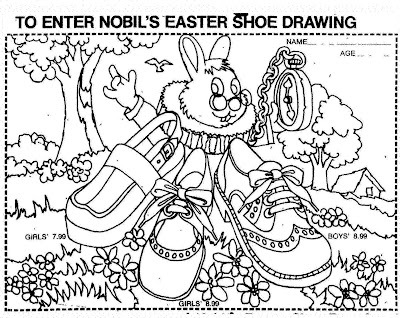 The winner received a pair of shoes for Easter. 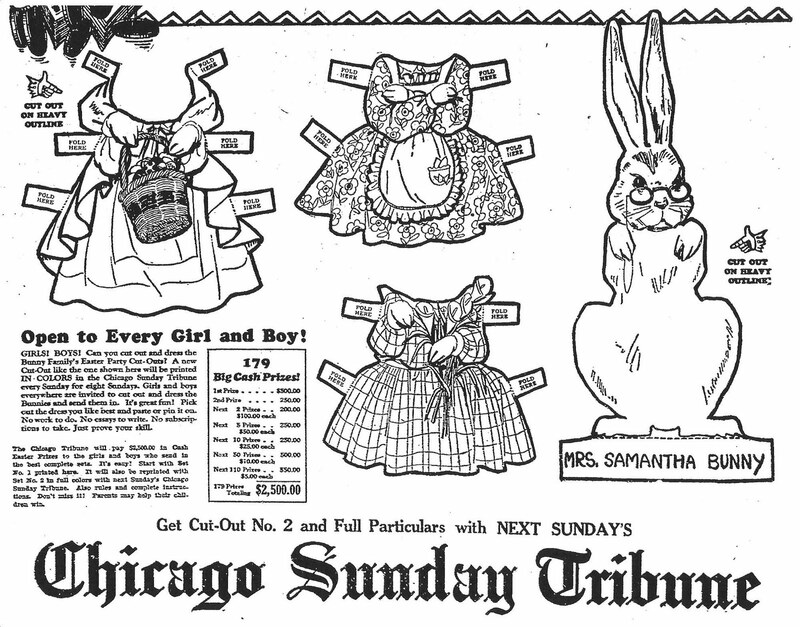 Mrs. Samantha Bunny was a paper doll from a paper doll dressing contest held by the Chicago Sunday Tribune in 1930. 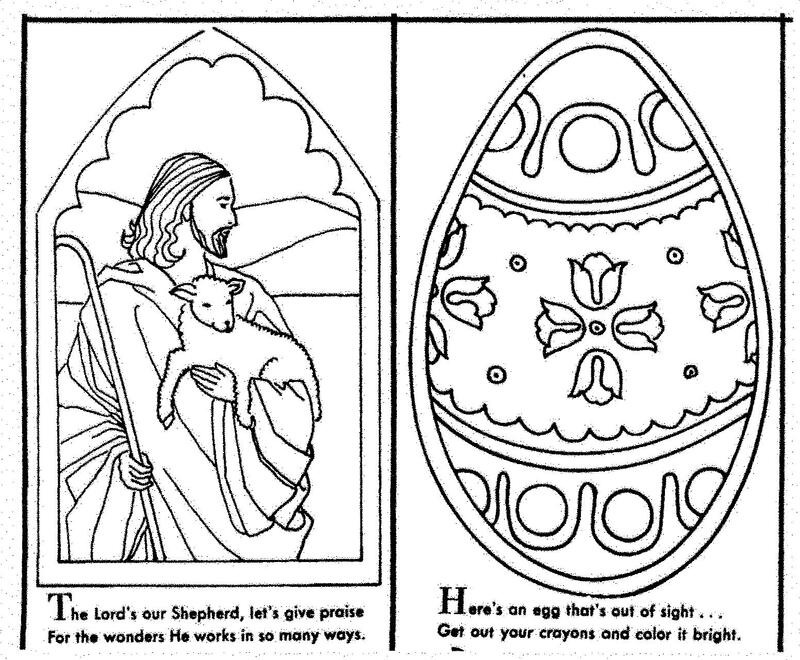 This is the ad that ran in an Ohio newspaper for the contest. 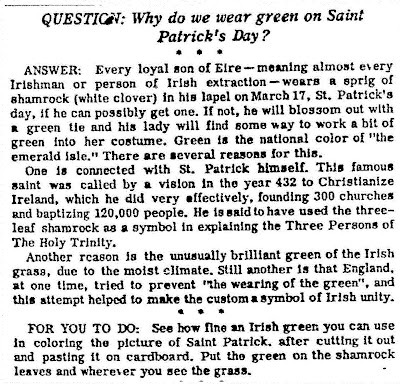 Appeared in a Pennsylvania newspaper on March 15, 1929. 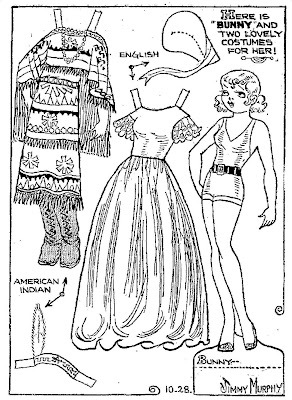 This Peggy Lovebyrd paper doll is from the comic strip "The Lovebyrds" by Paul Robinson and appeared in newspapers in June of 1933. 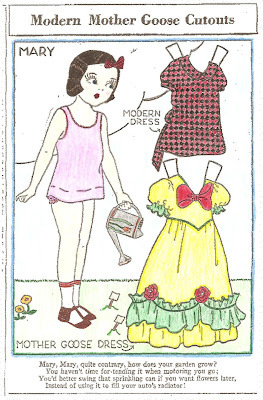 Dolores Del Rio paper doll from "The Movie Doll Family" by Laura Brock that ran in newspapers in 1934. 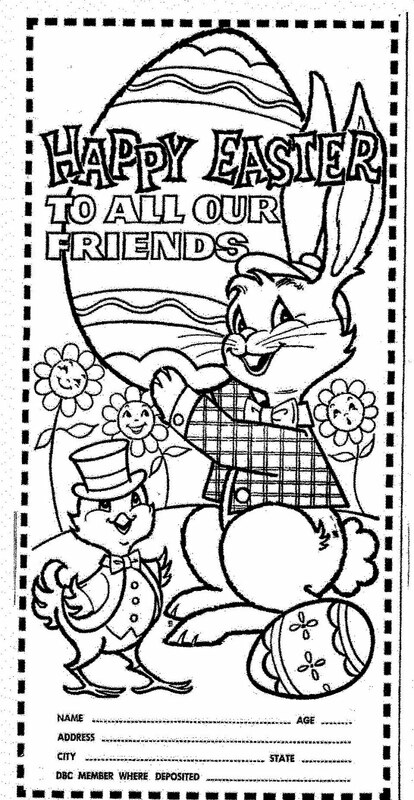 Another Modern Mother Goose Cutout. 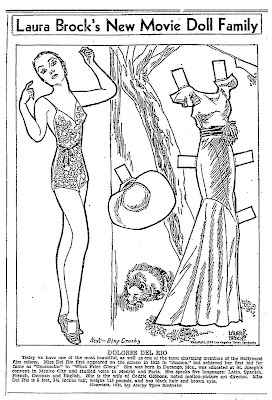 This Lucy Locket paper doll appeared in newspapers in the late 1930's. 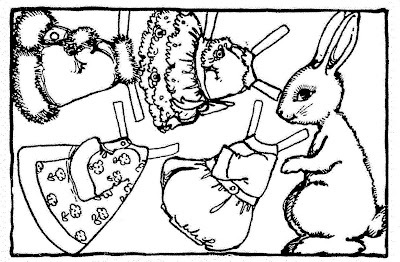 Addie R. Woodruff was the artist of the Modern Mother Goose series. 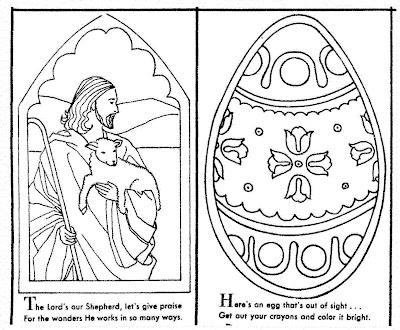 For You To Color "TINTED TRAVELS" by Hal Cochran. 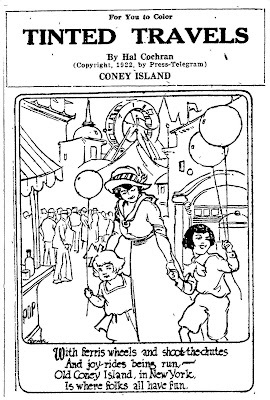 This Tinted Travels of Coney Island appeared in newspapers in 1922. 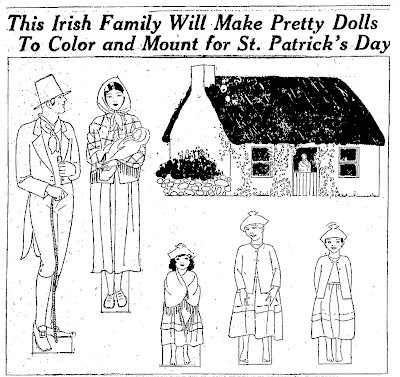 A paper doll family from the Aunt Elsie Magazine in the Oakland Tribune on March 27, 1921. 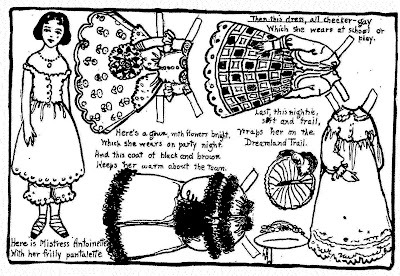 "Mistress Antionette With Her Frilly Pantalette" paper doll from the Aunt Elsie Children's Page in the Oakland Tribune. 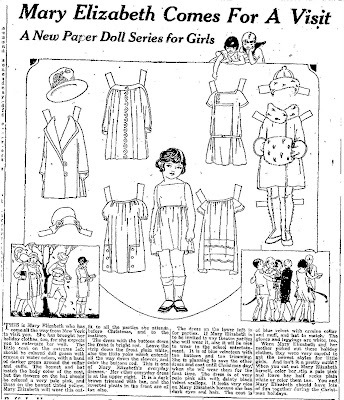 This paper doll appeared on November 28, 1920. 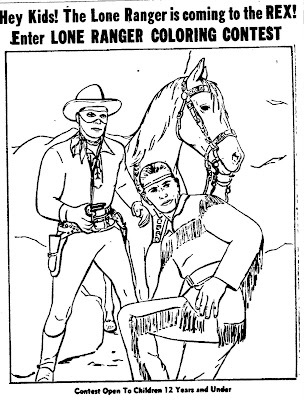 This newspaper coloring contest for the movie "The Lone Ranger" appeared in February of 1956. The movie was of course based on the popular television series and the movie starred Clayton Moore, Jay Silverheels, Lyle Bettger, Bonita Granville, Perry Lopez and Robert J. Wilke. The director was Stuart Heisler. 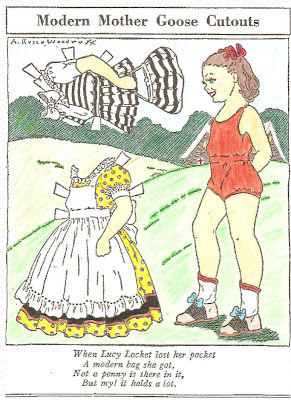 "Annabelle as The Pied Piper" from the Annabelle newspaper paper doll series. 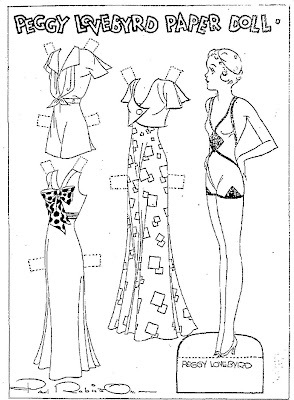 This paper doll appeared in papers in September of 1926. 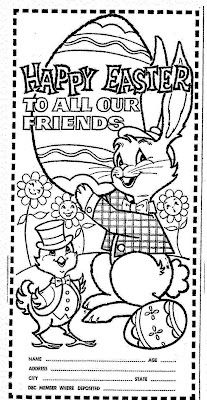 This movie coloring contest appeared in various newspapers in April of 1952. 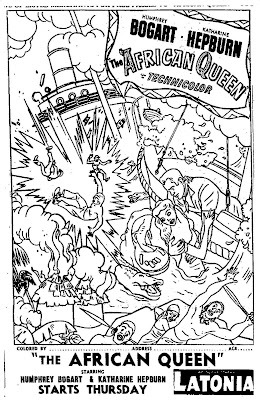 The African Queen starred Humphrey Bogart, Katharine Hepburn, Robert Morley, Peter Bull, Theodore Bikel and Walter Gotell. The Director was John Huston and the movie was scripted by James Agee from C. S. Forester's novel. Humphrey Bogart won an Academy Award for his role. This is one great movie. This is Mary Elizabeth who has come all the way from New York to visit you - a newspaper paper doll to color and cut out. 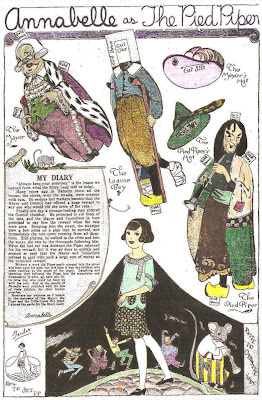 This paper doll appeared in newspapers on December 12, 1925. 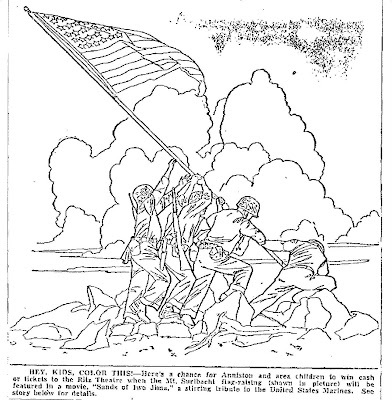 This newspaper coloring contest for the movie "Sands of Iwo Jima" appeared in an Alabama newspaper on November 03, 1954. Sands of Iwo Jima starred John Wayne, John Agar, Adele Mara, Forrest Tucker, Arthur Franz, Julie Bishop, Richard Jaeckel, Wally Cassell and Richard Webb. John Wayne received his first Oscar nomination for his role as a tough Marine top-sergeant. 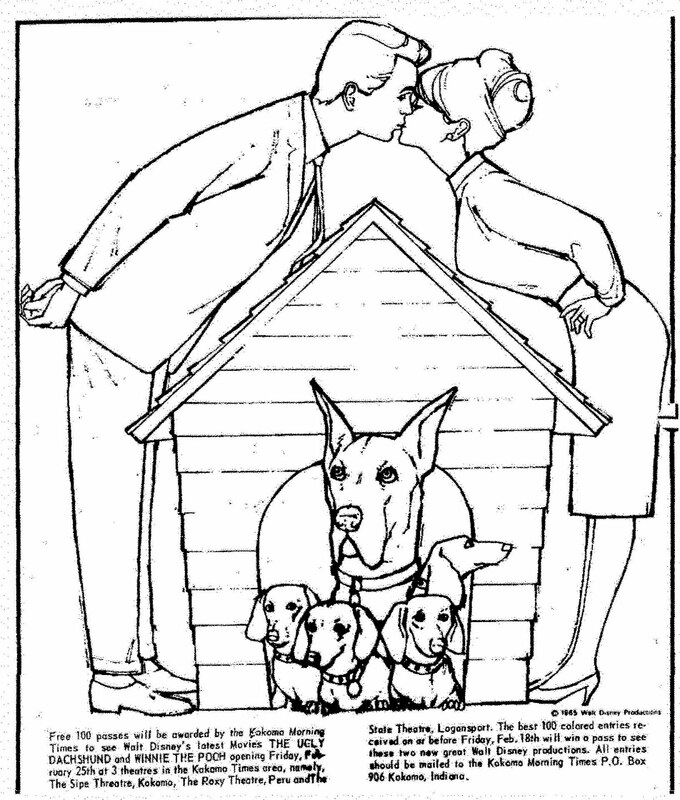 This ad for FROST BROS. appeared in a San Antonio newspaper on August 04, 1966. The paper doll has all the latest fashions for back to school. 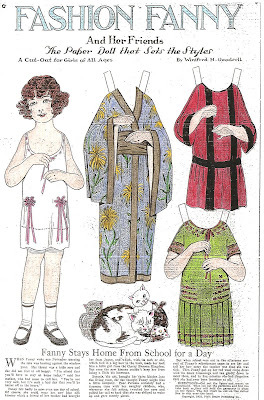 I have only been able to find three paper dolls in the "Fashion Fanny" paper doll series but I am still looking for more. 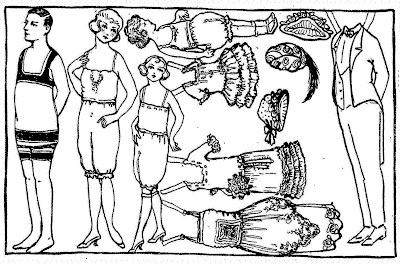 Fashion Fanny and Her Friends, The Paper Doll That Sets the Styles, appeared in newspapers in 1922. 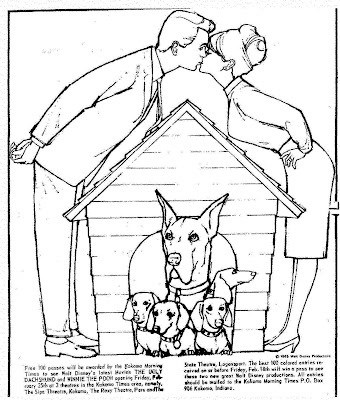 Fanny Stays Home From School For a Day appeared in newspapers on November 19, 1922. 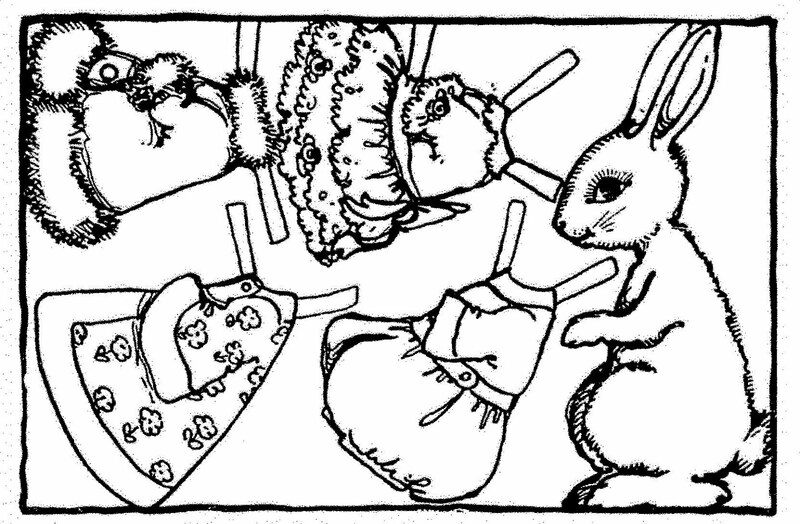 The series was drawn by Winifred H. Goodrell.